The weather is appalling and certainly does not appeal to me. It’s been raining for days. There are flood warnings for the Midlands and Southern England. Snow is moving south from Scotland and we are going walking. Today the "boys" consist of Larry, Peter, Mick and me. Ray had hoped to join us but unfortunately had not been well since New Years Eve. Needless to say L.P.and M. are amazed I’m taking part. They know that deep down inside I have a very strong affinity to fairweather walking. Walking on a day like this is not really my idea of fun. Larry had decided on the walk. Or at least where we would start the walk. This was the car park at the Seven Springs Public House (map reference SO 968169), which is a couple of miles south of Cheltenham. Although Larry had decided on the walk he decided to leave his map in Mick’s car and so, as per usual, I became navigator for the day. Deep down inside I think the others are all scared that they will get "ribbed" if they lose the way. I doubt that they would get lost if they had more practice - but I’d certainly have a little smile if one of them did get us on the wrong path. However, at least if I’m navigating they will have to wait for me if I go too slowly - which I usually do. The first part of the trek meant crossing the busy A435 and taking the Cotswold way south east until we met up with the Gloucester Way, which we followed to Upper Coberley, where Peter (he’s an ex teacher you know), pointed out the remains of a medieval village. He’s definitely the historian amongst us. Although the rest of us pretended to be impressed all we could see was undulations on the side of a hill. But the map and Peter said it was a Medieval Village and who were we to disagree. Continuing westwards, still on the Gloucester Way, we passed just south of Coberley and for the first time we really hit mud. We had seen some earlier but until now most of the "off road" bits had been up or down and, because of this, had been well drained. 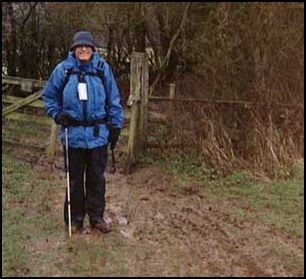 But now it was quagmire time and we were pleased that we had our walking poles to help us keep balance as we squelched through the mud. We (Peter) decided we should go to Crickley Hill Country Park and from there more or less follow the Cotswold Way back to Seven Springs. Please note that although I was responsible for the navigation usually someone else tells me where to navigate to. Makes for an interesting life. You will glean from this what the responsibilities are. Larry decides the area where the walk should be. Mick gets us there. Peter decides the route and I navigate it. Yes, we all have our duties. I wonder what Ray would have done if he had been there? Soon we passed a "long barrow". 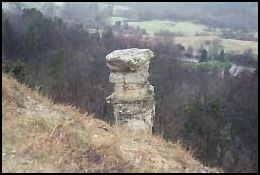 We would probably not have noticed it but Peter did and we "admired" it from the top of a hill while we had our elevenses. We then continued westwards past Cuckoopen Barn Farm (map ref. 945158) before turning left (south east) to Birdlip Radio Station and turning right (north west) to meet the A417, which we eventually crossed – a very busy road. By now we were wet. Drizzle had been with us most of the time since we had started the walk, hence we were all wearing waterproof jackets and overtrousers, the latter, of which were now very muddy. So although we were tempted by a hostelry, the Air Balloon Public House, we didn’t think the staff would have been very pleased to greet us if we had walked into the bar. So we crossed the road and took the path to Crickley Hill. Here the views were almost non-existent thanks to the mist and drizzle, which now, was even more in evidence. I must revisit in the summer to enjoy the views and find out what I missed this day. We now met up with another part of the Cotswold Way, which we followed northwards along very muddy tracks before reaching a tarmac lane. 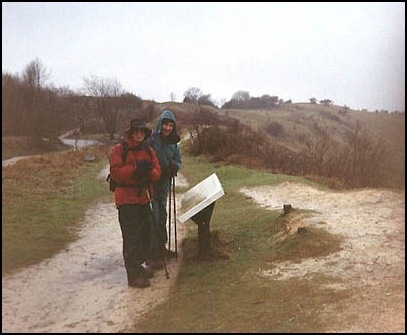 Here we turned right (still on the Cotswold Way) and within a few yards were greeted by sleet. But we were well protected although I had to endure a few more fairweather jokes before we reached a more substantial road (map ref 943171). Rather than cross it, and go past Ullenwood Manor and north to Leckhampton Hill, we turned left and took the road, which went generally northwards. We then took the next turn right and uphill to meet, yet again, the Cotswold Way as it started north on to Leckhampton Hill and passing close to the Devil’s Chimney. Although quarries scar this area, I think they add a beauty and ruggedness to the landscape. The views even on such a miserable day as today were better than I expected, although it would have been preferred if the visibility had been better. But I really enjoyed the Devils Chimney that was sculptured by local quarrymen . Unfortunately it was difficult to get a really good picture of it and I don't think the photographs really do it justice. While Larry and I were enjoying the views, Peter and Mick continued northwards. Although I shouted after them, I was too late. 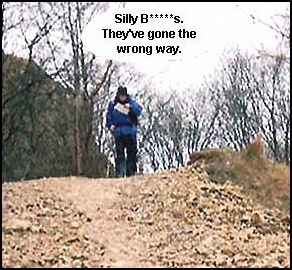 They had taken the downhill path when we should have gone onto the ridge to regain the Cotswold Way. Larry and I followed, with me cursing under my breath. If I’m navigating why don’t they consult me before going the wrong way, particularly when it means going uphill to regain the lost height. My knees don’t like it. But there were many paths going east so height could easily be regained by the younger members of the group. 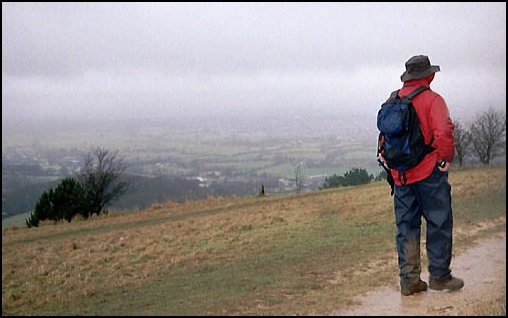 However, I knew I had been up a "pull" by the time the top of the ridge was reached and we met up with the Cotswold Way once more. Communication is a wonderful thing, even on hikes. This next part of the walk was superb and muddy. This was, without doubt, my favourite part of the walk. Besides generally walking on the level or down hill the views to the west and north were wonderful. You could look right down into the streets of Cheltenham and even in the murky conditions it was like a giant street map below. However, as we started to descend south east the path got muddier and muddier. Visibility was still reasonable and I could see the traffic in the valley below. However I was very much preoccupied with not slipping and falling over.Having completed about 90 % of this slippy downward path, I caught up with the others who had stopped to wait for me – I had been taking photographs. I stated how pleased I was that I had not fallen over and how glad I was that I had a walking pole with me. I then took one pace forward and in the words of Elvis P. I slipped, I stumbled and fell. Fortunately with the agility of a teenager – which I certainly am not – I managed to turn to the side and land on my hands. And other than dirty hands I remained clean. Needless to say there were no takers to pull me up. The "Boys" had all walked away and pretended they were unaware of my downfall! 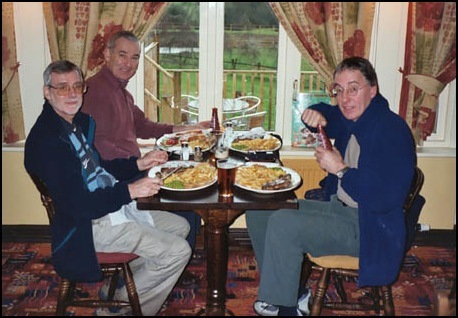 However, with the aid of damp grass and using my overtrousers, as a hand towel, I soon had my hands back in a condition that were a little bit less yucky.Mick, Peter and Larry and full plates before we "tuck into" the super pub food at the Seven Springs Pub. 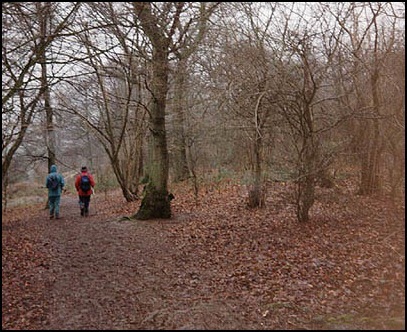 The walk was now nearing the end and it was not long before four wet figures with muddy boots and overtrousers reached the Seven Springs Public House. It wasn’t much fun taking off the boots and wet weather gear. But it was soon done and our next stop was the pub loos. I understand it’s bad manners to drink with dirty hands, and all our hands were dirty, although some were dirtier than others. But once that was over it was heaven. We really enjoyed our late lunch. The pub wasn’t too busy. The beer was O.K. and the food was excellent. Must go there again but I think I will wait for summer. As Peter, Larry and Mick keep telling me I’m more of a fair weather walker.